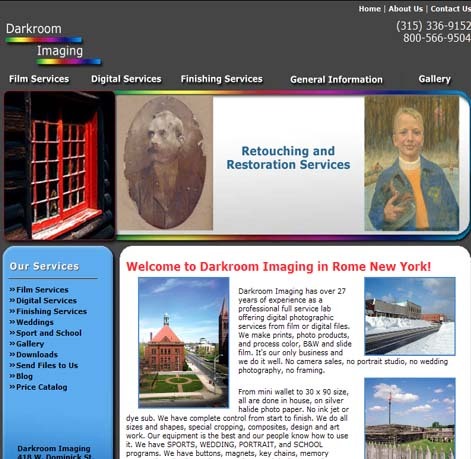 Darkroom Imaging has over 27 years of experience as a professional full service lab offering digital photographic services from film or digital files. We make prints, photo products, and process color, B&W and slide film. It's our only business and we do it well. No camera sales, no portrait studio, no wedding photography, no framing. From mini wallet to 30 x 90 size, all are done in house, on silver halide photo paper. No ink jet or dye sub. We have complete control from start to finish. We do all sizes and shapes, special cropping, composites, design and art work. Our equipment is the best and our people know how to use it. We have SPORTS, WEDDING, PORTRAIT, and SCHOOL programs. We have buttons, magnets, key chains, memory mates, photo books, and many unique card designs. We do everything from design to drop shipping or we can simply print your order. All images are checked and color corrected, as needed, to make your work the best it can be. Please take the time to browse our web page, print out our catalog and then send us your images. Fair prices, quality workmanship, quality material, free help, free software, it doesn't get any better. Call us today.